I did several projects in each of the areas and what can I say? I just love them! Those are real-world problems and millions and millions of people around the globe are working on solving them as we speak. Although it gives people the impression that the Internet has grown to its zenith, I'd say it's still in its infancy. We are not even close to maximizing the Internet's utility, let alone experiencing the full fruit it brings us. I'd love to become one of those who make people's lives easier by solving some of the problems. Go ahead and knock yourself out by browsing the following menu! [2012/12/25] It turns out when I started to work in the software industry my work has been focused on the backend and the frontend programming of large websites. My first job is for GoToMeeting.com and GoToWebinar.com, and second job is for Like.com which got acquired by Google in 2010. 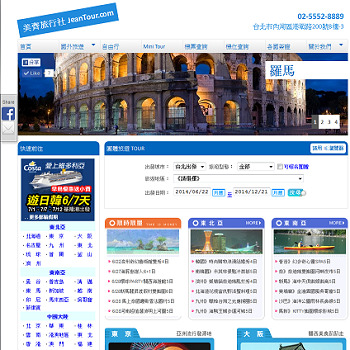 This website is for Jeantour, a travel agency in Taipei, Taiwan. This website is for San Francisco Taiwanese American Festival held annually. This website is for Prader Willi Syndrome Association who help Prader Willi Syndrome patients. This program uses Google API to search for documents similar to the given one.